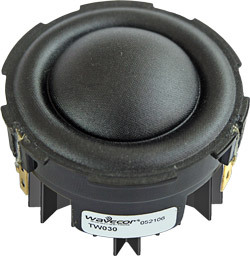 This tweeter is identical to the TW030WA02 except that TW030WA02 has a face plate mounted while TW030WA04 is shipped without face plate. Wavecor tweeters without face plates are only available in bulk packaging. Therefore they are not available through our retail sales channels. For manufacturer’s orders certain Minimum Quantities are required (typically full master cartons). Current specifications are available here.